O nas › Zolline to oryginalna biżuteria, pomysł na prezent dla ukochanej osoby. Zolline jewelry is designed with passion. We combine precious ores with gemstones and unexpected, raw materials such as wood or leather. Through our designs we divest them of severity and reveal their new, uncharted presence. Zolline came to life as our response to widespread departure from traditional craftsmanship in favor of predesigned, machine-made mass production based on ready-made, imported items. Through our work we celebrate originality and pass it on to our customers in each designed element. We want Zolline jewelry to let its bearers to freely express their sensitivity and stand out in any situation. Because we believe, that each of us is unique. 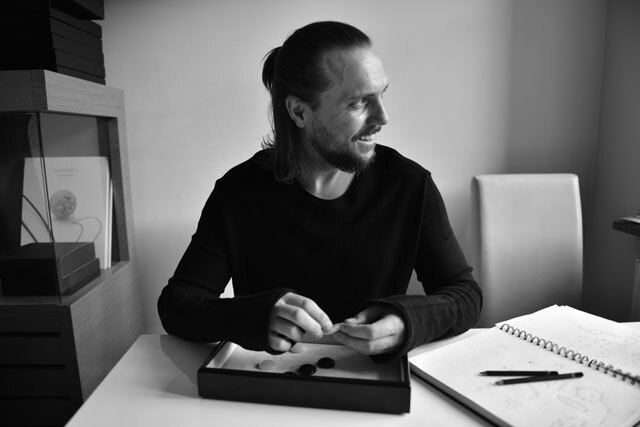 Exquisite and unique – Marcin Wesołowski’s designs endeared him to masses of clients worldwide. His innovative approach to working methods and sincerity that emanates throughout his creations are the hallmark of this talented, Gdansk-based designer. Less is more – is what he describes himself, but Marcins style reflects a wealth of inspiration and variety of themes. As one of the few designers he allso personally crafts his work, bringing individual, sophisticated character to each element.